The SightMaster Lensatic is equipped with a parallax-free, glass lens, 10x magnification sighting system integrated into the aluminum housing. Capsule: Anti-static and liquid-filled for optimal dampening of the SightMaster card. Compass card: The SurveyMaster Lensatic is equipped with an aluminum compass card with precision scale. It features a top scale for direct readings on the top of the capsule at the lubber line. It also has sapphire-jewel bearings for friction-free movement of the card, allowing fast and accurate readings. Accuracy: +/-0.5° from true magnetic course with precision sighting. +/-1.0° from true magnetic course with direct reading at the lubber line on top of the capsule. 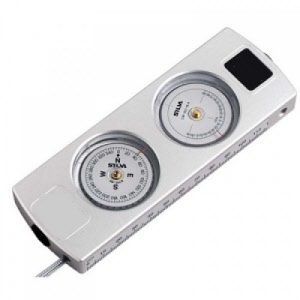 Clinometer card: The ClinoMaster Lensatic is equipped with an aluminum clinometer card with precision scale. It is equipped with a top scale for direct readings on the top of the capsule at the lubber line. It also has sapphire-jewel bearings for friction free movement of the card, allowing fast and accurate readings. Accuracy: +/-0.25° from true angle with precision sighting. +/-1.0° from true angle with direct reading at the lubber line on top of the capsule.